Kim Gutschow received her Ph.D. from Harvard University’s Department of Anthropology in 1998. She completed a post-doc at Harvard University’s Society of Fellows and taught at Brandeis and Wesleyan Universities before coming to Williams. Her research interests include Buddhism, Hinduism, South Asian religions, gender, the body, ritual and power, religion and conflict, Himalayan and Tibetan cultures, Tibetan medicine, ethnography, and the politics of water. Her scholarship includes over a decade of fieldwork in the Indian Himalayan regions of Zangskar and Ladakh, and shorter research stints in Nepal and Thailand. 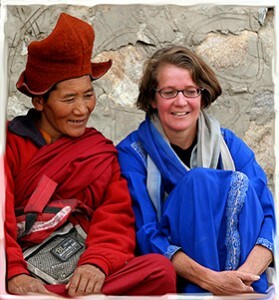 Her recent book, Being a Budddhist Nun: The Struggle for Enlightenment in the Himalayas penetrates the contradictions between Buddhist practice and doctrine with vivid oral narratives and thick description of daily life amid a harsh Himalayan landscape. Her ethnography reveals an enduring gender hierarchy in which monks bless and purify the fields and houses where nuns toil. In explaining Buddhist merit making in terms of butter and barley, rather than simply meditation she explains how and why nuns remain bound by twin tyrannies of production and consumption. She concludes that Buddhist monasticism reflects the very world it was supposed to renounce. “The book raises questions that are significant far beyond the Himalayas, ranging from the usual questions of gender…for which Kim Gutschow offers new answers, to the not-so-usual questions of celibacy, in which she sees newly relevant values,” says Wendy Doniger of the University of Chicago. Gutschow’s other research projects further illustrate the significance of studying religious discourse through lived experience and practice. Her studies of Buddhist rituals and Tibetan medicine extend her interest in the difference between the realms of text and practice. She is interested in the tensions between purity and pollution as well as the portrayal of the female body in ritual and medical practices. She has also conducted research and published on the gender dynamics of fasting rituals, Buddhist pilgrimage, sacred landscape, and the politics of irrigation in the Himalayas. Her work in visual and applied anthropology includes working as translator and location expert for Behind the Ice Wall, an award-winning documentary film produced by the Discovery Channel. She has also collaborated on a Dutch documentary about Zangskari nuns and a German CD recording monastic chants, both of which channel some funds to aid Zangskari nuns. Over the last fourteen years, Gutschow has raised over fifty thousand dollars for Zangskari nuns in collaboration with a Canadian NGO, Gaden Relief Projects. “The Practice of Tibetan Medicine in Zangskar: A Case of Wind Disorder“(PDF). Forthcoming in Healing at the Periphery: Ethnographies of Tibetan Medicine in India. Laurent Pordie, ed. Durham, NC: Duke University Press, 2009. “The Politics of Being Buddhist in Zangskar: Partition and Today” (PDF), India Review 5 (3–4): 470–498. 2006. “How Buddhist Renunciation Produces Difference.” In Women’s Renunciation in South Asia: Nuns, Yoginis, Saints, and Singers. Meena Khandelwal, Sondra Hausner, and Ann Grodzins Gold, eds. New York: Palgrave Macmillan, 2006. Being a Buddhist Nun: The Struggle for Enlightenment in the Himalayas. Cambridge: Harvard University Press, 2004. ** Winner: Sharon Stephen’s Book Prize, American Ethnological Society. “A Landscape Dissolved: Households, Fields, and Irrigation in Rinam, Northwest India.” In Space and Territory in the Buddhist Himalaya. Niels Gutschow, Charles Ramble, and Ernst Steinkellner, eds. Vienna: Franz Steinkellner Verlag, 2003. “The Delusion of Gender and Renunciation in Buddhist Kashmir.” In Everyday Life in South Asia. Diane Mines and Sarah Lamb, eds. Pp. 261-274. Bloomington: University of Indiana Press, 2002. “What Makes a Nun? Apprenticeship and Ritual Passage in Zangskar, North India.” Journal of the International Association of Buddhist Studies 24(2): 187-216, 2001. “Hydrologic in the Western Himalaya: Several Case Studies From Zangskar.” In Culture Area Karakorum Studies. Karakorum-Hindukush-Himalaya: Dynamics of Change. Irmtraud Stellrecht, ed. Pp. 443-473. Köln: Rudiger Köppe Verlag, 1998. “Lords of the Fort, Lords of the Water, and No Lords at All: A Comparison of Irrigation in Three Tibetan Societies.” In Recent Research on Ladakh. Henry Osmaston and Ngawang Tsering, eds. Pp. 105-116. Bristol: University of Bristol Press, 1997.